I have a confession. My usual weeknight pizza is made from a box. We love the Chef Boyardee Pizza Kit. It is Chicken Legs' favorite pizza. He prefers it over any other pizza - homemade or restaurant. I didn't have a pizza kit in the pantry for pizza night last week, so I made a quick pizza crust from Bisquick. I was worried that Chicken Legs' wouldn't like it, but he declared that he liked it better than the Chef Boyardee crust. WOW! He really, really likes the Chef Boyardee, so I knew the crust was a keeper. I fancied up the pizza crust by topping it with some frozen popcorn chicken and fresh mozzarella cheese. I added some mushrooms because Chicken Legs loves mushrooms on his pizza. The pizza was a huge hit with us. I loved the fresh mozzarella and chicken. The crust is our new standard pizza crust. I love it because it only takes a few minutes to whip up. It is great for a quick and easy weeknight meal. In a medium bowl, mix together Bisquick and water just until combined. Allow to rest in a warm place for 5 minutes. Roll out pizza dough on a pizza stone or pizza pan. 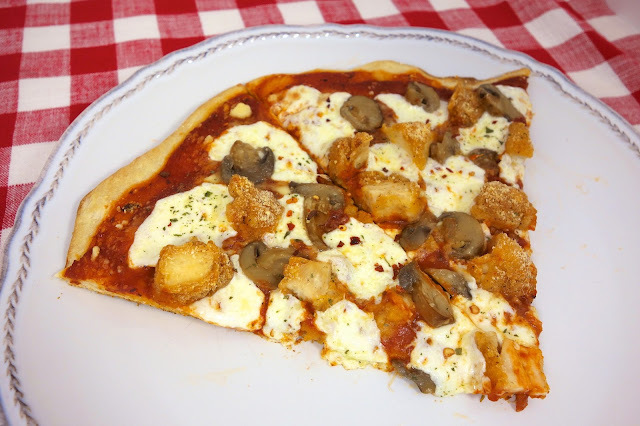 Top crust with pizza sauce, chicken, mozzarella and mushrooms. Bake for 12-15 minutes, until cheese is melted and crust is browned. Used the crust recipe to make a 3 cheese pizza. Came together fast and was tasty :) Thanks for the recipe Steph! 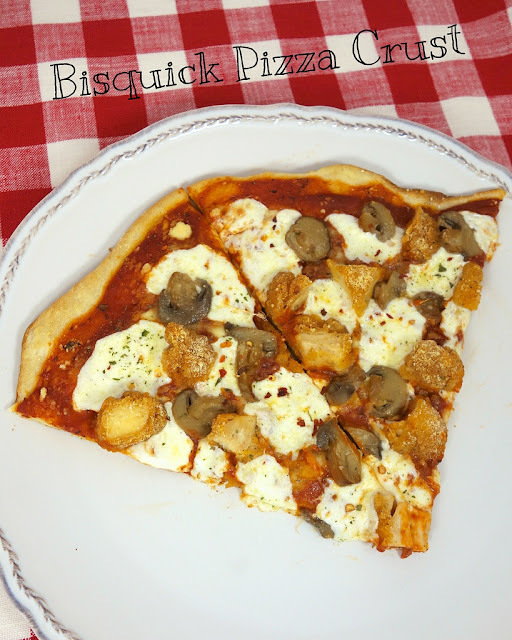 I had no idea just Bisquick and water made a tasty pizza crust. I wish I had a slice of this happiness right now!! It looks insanely good! This looks goooood :) i definitely need to give making my own pizza a go soon for sure, so much fun too! Yours looks scrumptious.